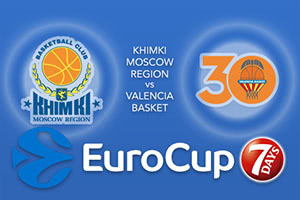 Game 2 of the EuroCup quarter-final matches take place on Friday night and there is a familiar story across all of the games. This is because all of the home teams on Tuesday night grabbed a win and when you are dealing with a Best of 3 scenario, that leaves the losing side living very precariously heading into the second game. All of the losing teams are now at home on Friday and Khimki Moscow Region are first up to see if they can keep the tie alive for a third game. The Spaniards got off to a flying start and they had a 17 point lead at half-time and this was more than enough to see them through to the end of the game in comfort and style. There has been bad news this midweek for Valencia with the story that Vyacheslav Kravtsov has been ruled out for the rest of the season. Add in the fact that Antoine Diot will be absent and you have a Spanish team that has been slightly weakened but importantly, they hold a 1-0 lead in this match-up and they know that this provides them with a strong upper hand. Alexey Shved has been in fine form this season and he grabbed 24 points, 5 rebounds and 7 assists earlier this week. Mind you, Shved would have swapped those points for a win, so he will no doubt be slightly envious of the evening that Fernando San Emeterio had for Valencia, providing an average of 17 points, 8 rebounds and 5 assists. There was support for Shved from Robbie Hummel, who grabbed 13 points and EJ Rowland, who offered 12 points but there is a need for more Khimki players to stand up. Bojan Dubljevic grabbed a double-double of 11 points and 11 rebounds in the opening game and if he shows that again, it could be a massive night for the Spaniards. The hosts are fancied by the bookies to claim this game but it is likely to be a close-run thing. This means backing Valencia at +4 which you can find at odds of 1.90 is likely to be a smart bet. If you are looking for the Over/Under market, look to go UNDER 163.5 which is provided at odds of 1.90. Bet Now!